To view the PDF Fact Sheet on the Campo Road Sewer Replacement Project, click here. The project involves installing approximately 1.41 miles of 15-inch-diameter sewer pipeline in easements that cross the properties of Rancho San Diego Village and the Rancho San Diego Town Centre, and in the SR-94 public right of way between Avocado Blvd and Jamacha Road. Construction started in September 2017 and is scheduled to be completed in summer 2019. To address environmental concerns, the District paused some activities from March 2018 to September 2018. Otay Water District provides sewer collection for more than 15,000 people in the Jamacha Basin communities of Rancho San Diego, Calavo Gardens, Singing Hills, and portions of Mount Helix. The District regularly invests in capital improvement projects to assure efficient operations, comply with regulations, and replace aging infrastructure. District capital improvement projects are funded through user rates and capacity charges. 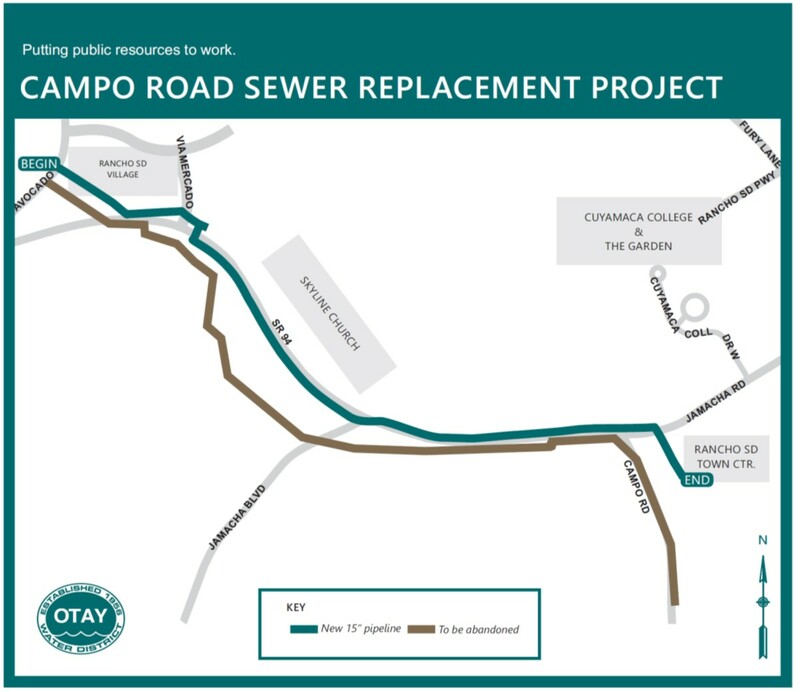 The Campo Road Sewer Replacement Project is part of an ongoing series of projects to rehabilitate and upgrade the sewer system in the communities served by Otay Water District. The new pipeline will replace a 10-inch sewer main that can no longer provide adequate capacity for sewer flows in the area. The new pipeline will reduce the potential for sewer overflows, and its new alignment will allow the District to construct and maintain the pipeline without disturbing sensitive environmental areas. After the new pipeline is placed into service, the existing pipeline will be removed or filled with concrete and abandoned in place. Sewer service will not be affected. Sewer pipes are being replaced in sections, for example, between one manhole and the next. As the process begins, an upstream manhole will be fitted with a pump bypass system. Sewage is then moved through a fully contained roadside relay system to the next downstream manhole. In consultation with Caltrans, the District has specified night work for this project, with the majority of activity limited to the hours between 9 p.m. and 5 a.m. Temporary traffic control is also specified for project work at the Jamacha Blvd. / SR 94 intersection. Steel plates will be used to cover open trenches at the end of each work day. Trenched areas will also be repaved at the end of the project. Please drive carefully in the construction zone. During construction, some dust and noise will be unavoidable. Mail delivery and trash collection will not be affected. To protect the extensive environmental habitat along SR 94 and reduce the need for sound walls, the District will limit construction during the nesting season; primary construction activity will occur from September 2017 to February 2018, and from September 2018 to February 2019. The District’s budget for the Campo Road Sewer Replacement Project is approximately $10.3 million. For additional information about the project, please contact the Project Manager, Steve Beppler at (619) 670-2209 or via e-mail at steve.beppler@otaywater.gov.